It has been a while since I have posted a landscape photograph from my own home country. Partly because I have just been flat out with other things and also because I had not really had a chance to sit and sort through a series of photographs I shot toward the end of Winter up at Mount Buffalo in the Victorian High Country. 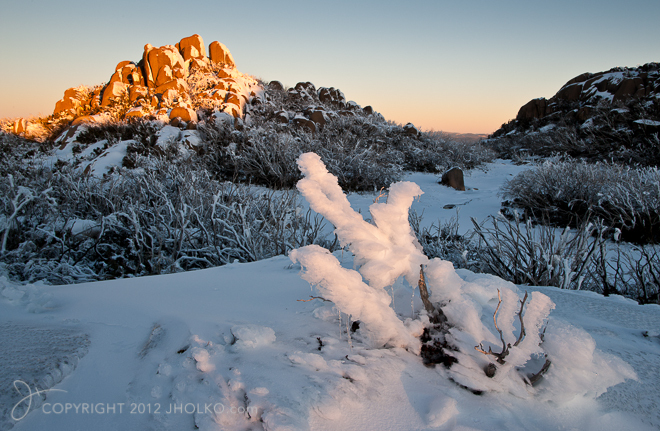 Mount Buffalo is my favourite location in the Victorian High Country for landscape photography – particularly in Winter. The large granite boulders and outcroppings make wonderful subjects that are very beautiful when covered in snow. Snow is a photographers best friend in the Australian bush – it really aids in hiding much of the messy scrub and underbrush that is not particularly photogenic. This photograph was taken at an area known as Mahomet’s Tomb just on sunset. I had hiked up to the location anticipating that as the sun dropped low to the horizon it would catch the outcropping of boulders known as Mahomet’s Tomb. For the shot to work I needed a clear horizon to the west so as not to obscure the setting sun and light (which I was fortunate to get). Shortly after I made the photograph I was wandering around down in the valley area pictured and went through the ice up to my waist in a hidden creek – it took me some to extricate myself. It was a most uncomfortable experience; but it did make the shoot memorable; even if the hike back to the car was cold and wet.